I would consider myself a fairly organized person, and as such, I tend to gravitate towards lists. While I have several list apps, I also like and use pen and paper lists. Given this and my love of books, Literary Listography seemed like a natural fit for me. For those aren't familiar with the Listography books, they are an offshoot of the website and app that encourages users to create and share public lists about anything (you can read about it on the Listography website). 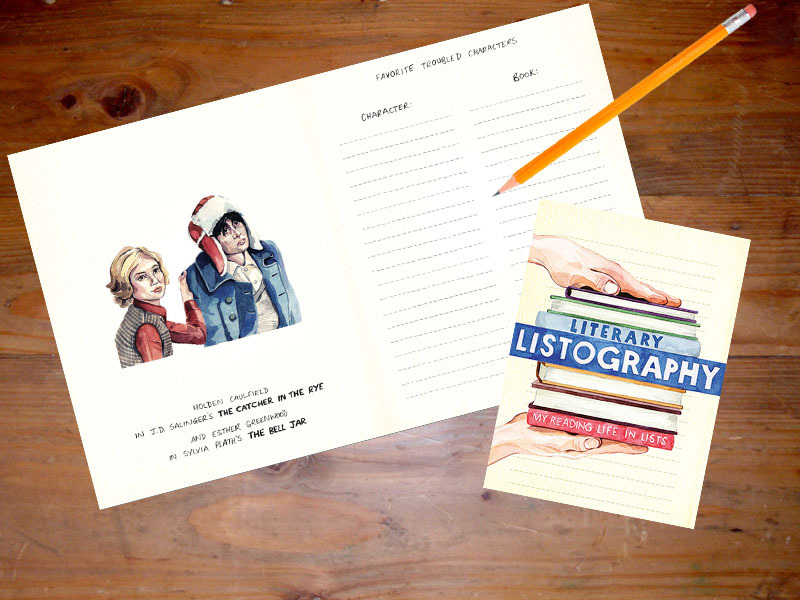 Since the first Listography book was published in 2007, there have been 12 books in the series that focus on different themes, including friendship, food, and film. Unlike other books, the Listography books is very much driven and created by the reader, and Literary Listography is no exception. Billed as a "selection of lists chosen just for the book lover," the book includes 70+ lists that are designed to delight and intrigue any bibliophile. Rather than providing you with lists of books to explore, this book relies on you to interact with it and create lists based on the prompts. With prompts ranging from the expected ("My Favorite Authors") to the atypical ("Fictional Crimes I've Witnessed"), this book is fun and thought provoking. Some of my favorite prompts included "Fictional Characters I'd Go on a Date With" (let's be honest - if you love books, you've probably considered this. For the record, my list includes Gilbert Blythe from the Anne of Green Gables books), "Cultures I've Immersed Myself in Through Literature," and "Words I Love and Hate the Sound Of." Besides the great list ideas, Literary Listography had a number of features that I appreciated and that added to the experience. Each prompt is accompanied by a full-color picture depicting a book related to the prompt it faces. For instance, a picture of a backpack and hiking books symbolizing Cheryl Strayed's Wild goes with the prompt "My Favorite Memoirs and Autobiographies." Besides this, the physical features of the book make it a pleasure to use. The pages have a nice weight and texture that hold up to even fountain pen ink and resist smudges, and the book pages lie flat, which makes it easy to write inside. If you are looking for a book to help you record your reading life and thoughts, Literary Listography could be the perfect book for you. It would also make a great gift for the book lover in your life (just be prepared for him or her to become preoccupied by it). Book Review: "Defying the Nazis: The Sharps' War"
Following any of the horrific events that have become all-too-common in modern society, someone on social media inevitably shares Mr. Rogers’s advice to “’Look for the helpers. You will always find people who are helping’… I am always comforted by realizing that there are still so many helpers – so many caring people in this world.” These words are true, but after so many tragedies and so many Facebook posts, it becomes easy to dismiss or forget about them. Artemis Joukowsky’s Defying the Nazis: The Sharps’ War provides clear proof of the veracity of this sentiment. The book tells the true story of Waitstill and Martha Sharp, who took on the enormous task of helping refugees in Europe as the Nazis were coming to power and World War II was starting. It is also the companion book to the Ken Burns documentary that will be airing on PBS in September. While the Sharps seemed like an ordinary couple, they had an extraordinary sense of duty that led them to accept the mission put forth by the American Unitarian Association to go to Prague, Czechoslovakia on the eve of the Nazi invasion. Despite having two young children, Waitstill and Martha go to Prague, learn ways of circumventing the obstacles in their way, outwit the Gestapo, and work to help those who are being oppressed and hunted by the Nazis. After leaving Prague and having a short sojourn at home, they return to Europe during World War II to continue helping those they can. In many ways, this story seems too fantastic to be true, but Joukowsky, who is the Sharps’ grandson, does an excellent job providing research and facts as support. In some instances, the number of names, dates, and references can weigh down the narrative, but the text’s focus never wavers for long. Joukowsky’s writing style also does not veer far away from the facts. If it is not verified in Martha and Waitstill’s correspondence, excerpts of which are included, or through his interviews with him, the text takes pains not to dramatize the events. This helps further establish Joukowsky as a trustworthy author, but it also can make the narrative a little dry, which is surprising given the suspense that is built into the story. However, despite these minor issues, the book moves quickly and leaves the reader wanting to find out what happened to the Sharps. Additionally, there are places where the straightforward narration works to the book's advantage. The description of the Nazi invasion of Czechoslovakia is especially sobering; any further dramatization would have detracted from the horror of the event. Another aspect that reinforces the book’s reliability is that Joukowsky examines some of the more everyday facets of the Sharps’ lives. A prime example of this is the tension that exists between the good that Martha wanted to do by helping refugee children and the fact that she did this at the expense of spending time with her own children. Also, rather than closing with the Sharps’ second mission to Europe, Joukowsky follows them post-World War II, as they grow further apart both literally (Martha did a lot of travelling on the lecture circuit, while Waitstill returned to Prague to work for the American Committee for Relief in Czechoslovakia) and figuratively and after their marriage ends. In a perfect world, their bond would have been galvanized by the shared experiences in Europe and would have remained strong. Joulowsky’s exploration of its disintegration reinforces the reality of this story; it is not a fairy tale or fable but the story of two seemingly ordinary people who were able to accomplish extraordinary things under great duress and in the face of seemingly insurmountable obstacles. All in all, Defying the Nazis is a worthwhile and important book. Besides providing the Sharps with the attention they so richly deserve for their heroic actions and showing the personal cost that can come with such actions, it also illustrates how people can rise to the occasion. In short, it is another reminder for us to look for the helpers.